Sandy-damaged homes hit the market at bargain prices. This recent article from Associated Press reveals the mindset of sellers, buyers and brokers dealing with homes affected by Hurricane Sandy that are going on the market this Spring. It sounds like the premise for a new reality TV series: “Hurricane House” — people scouring waterside communities looking to buy homes damaged by Superstorm Sandy at a deep discount. While there are bargains out there, ranging from 10 percent off pre-storm prices for upscale homes on New York’s Long Island and the Jersey Shore to as much as 60 percent off modest bungalows Staten Island and Queens, it’s still very much a game of buyer beware. Not only are buyers are on the hook for repairs and in some cases total rebuilds, they’re also wading into a host of potentially expensive uncertainties about new flood maps and future insurance rates, zoning changes and updated building codes. “It’s totally changed the way I sell real estate,” said Lawrence Greenberg, a sales associate with Van Skiver Realtors, whose own Mantoloking, N.J., office was wrecked in the storm. Prior to Sandy, prospective buyers rarely mentioned issues such as flood maps and building elevations until the matter of flood insurance came up — often at closing. “Now, everybody asks the question of elevation,” Greenberg said. Even if potential buyers plan to tear down and build new, they ask about the pending changes in flood maps proposed by the Federal Emergency Management Agency, because flood insurance rates will depend upon the new zones. There is no sign of a mass exodus from shoreline communities. The number of for-sale listings in January in the 380 zip codes hit by the storm was about 2 percent below the same time last year, according to online real estate information company Zillow Inc. That indicates that most homeowners are rebuilding, or have not yet decided how to proceed. But real estate agents in New York and New Jersey say the majority of homes for sale in these areas have some damage from the Oct. 29 storm, and it appears to them that a rising number are being put on the market as the spring home-buying season approaches. New listings range from destroyed oceanfront properties being sold for the land, to flooded bayside homes untouched since the storm that must be gutted. Even the few undamaged homes in affected neighborhoods are listing at prices about 10 percent lower than they would have been pre-storm. Some sellers are overwhelmed by the daunting prospect of restoring a damaged home. Some are older homeowners who had stayed in the houses where they raised their families, but now are relocating. Some didn’t have flood insurance. “They either don’t have the funds or don’t have the energy to go through the renovating and rebuilding process,” said Jeff Childers, a broker with Childers Sotheby’s International Realty in Normandy Beach, N.J.
Lisa Jackson, broker and owner of Rockaway Properties in the Belle Harbor section of Queens, N.Y., said a number of her new listings are homes owned by senior citizens. One 85-year-old client was living alone in her 1940s-era six-bedroom, six-bath brick home right on the beach. 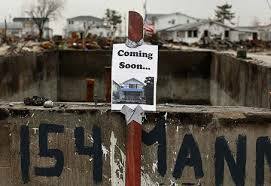 The house was hammered by Sandy, and must be at least partially demolished, but will still command a hefty price. “Everything on the water is big money,” Jackson said. But the $3 million listing price is nevertheless a huge discount from the roughly $4.25 million it would have commanded before the storm. Another set of sellers were in the process of getting out before the storm hit. Jackson had 18 properties in contract prior to Sandy, but all of those sales either fell through or were renegotiated for a lower price. One 1930s-era three-bedroom, two-bath house with a view of the bay was in contract for $665,000, but the entire first floor was gutted after it took on about four feet of water. The buyer, a single woman, was unwilling to take on the renovations. The property is back on the market for $550,000. That’s a 17 percent discount, but the eventual buyer will have to pay for new floors and walls, plus a new kitchen and bathroom. Still, that sort of cut might make the neighborhood affordable for a family that was priced out in recent years, when houses were selling for $750,000 and more. And in one sense, buying a storm-damaged home can offer an advantage, said Tom Tripodi, president of the Tripodi Group/ Douglas Elliman Real Estate in the Long Island city of Long Beach, where damaged houses are selling for about 10 percent less than before the storm. In addition to people looking to create their dream house out of a damaged home, Tripodi has seen investors eyeing the area. In Long Beach’s West End neighborhood, for example, investors are looking to tear down gutted 1920s-era ranch homes and build bigger houses with multiple stories at higher elevations in their place. The shorefront sections of Staten Island are also seeing accelerating turnover of homes that are likely to eventually get torn down. Lee Venezia, a broker with Neuhaus Realty Inc., recently sold three adjacent bungalows owned by a longtime resident of Staten Island’s Midland Beach for $240,000 cash — about $20,000 less than each one might have garnered before the storm. “The homeowner refused to go back,” she said. The buyer will fix the properties up and rent them “until the dust settles,” Venezia said. Once new flood maps are finalized and new building codes sorted out, she expects the houses to be sold again to a developer who will replace them. The new flood maps must go through public hearings before they are finalized, a process likely to take two to three years. Meanwhile, public officials and homeowners are trying to look to the future. New York Gov. Andrew Cuomo recently announced a plan to buy out the entire Staten Island neighborhood of Oakwood Beach and allow the land to revert back to the marshland it once was, because the homes there have flooded multiple times. It remains unclear if any other neighborhoods might get bought out. That may be the best hope for homeowners like Michael Kuhens, who has been trying to sell his bungalow in Staten Island’s Ocean Breeze section, which was ripped off its foundation by the 14-foot storm surge. A buyout would be attractive because, instead of dealing with bargain hunters, the state is offering pre-storm value. The Best Day to List a Home is….